Thanks for all of your comments on my last post! It is good to know what I am dealing with! They sure named Mealybugs appropriately, didn't they. I kinda liked the name I gave them though. Thanks, Cindy for saying the soapy solution will kill them. They sure look like a soft bodied bug. I will look them up in my books now. That is my next thing to do tonight! Busy day with the grands today. Fun, funny, joyous, tiring, but the best thing ever! I have been blessed. 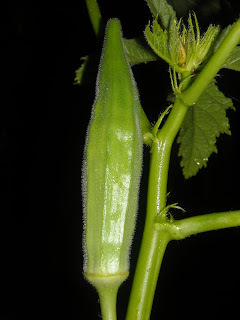 Yes, I really agree with the fact that the okra bud is so beautiful! I put that one shot I got on my desktop and I can just stare at it for a few moments and be so happy. 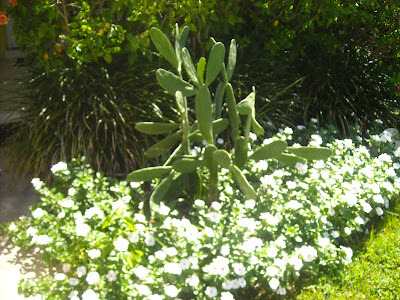 Stapeliad, I appreciate that you included the Earth in a list of things I have been blessed with! That is such a truth, and I had not fully realized it until I read it in print. This is my real happiness. Why didn't I become a park ranger??? I just know I would have loved it. When I retire (well, once I am back to work again, that is), I will volunteer in a park. We have some gorgeous State Parks here...some right on the Atlantic. Speaking of work, I got a call today (just one day after submiting an application). But...all they can offer me is to work Sat and Sunday either from 3-11pm or 11-7am. She wanted me to work every weekend, or every other, but required Sat and Sun (both days). I can't do that with the grands. So another job bites the dust. It is raining cats and dogs here. I hear there is a tropical depression somewhere around here. We are under a flood warning until 2pm tomorrow! I love the sound of rain, and I know every living thing out in my yard is so happy! Yeah. Two bads and two goods. I was walking around the neighborhood yesterday, and thought I would just take a pic of some of the ruin left behind by a foreclosure. It makes me wonder where are the code enforcement people??? 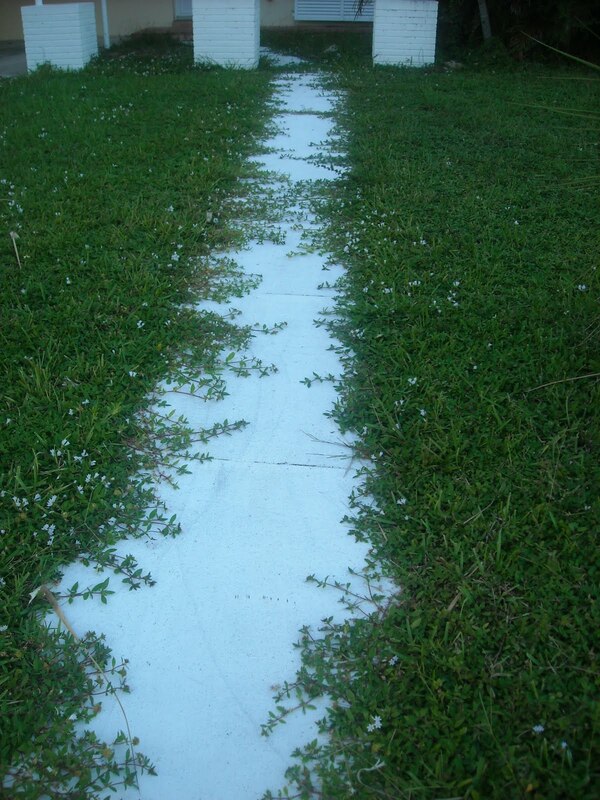 Yes, bank,,,you have to keep the lawn mowed, but what about a little edging here and there too?? ?Sometimes I want to strangle the code enforcement people...hello...where are you????? Aren't property values plummeting well enough without adding this to the mix? 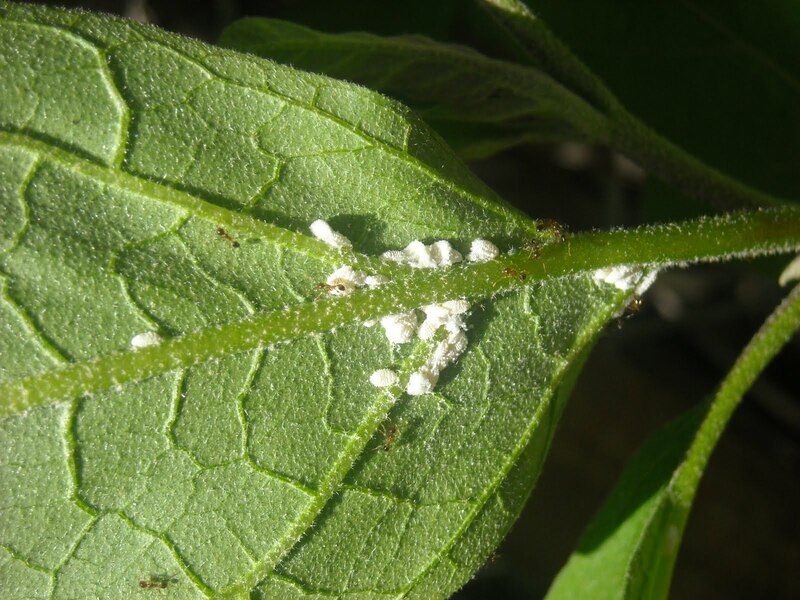 What are these white fluffy-looking bug/things on the undersides of my eggplant leaves??? I think I will call them Gross Wooley Monsters, becasue they made me want to vomit when I saw them. YUCK. I sprayed them with my Eco Sense by Ortho and hopefully they are goners! 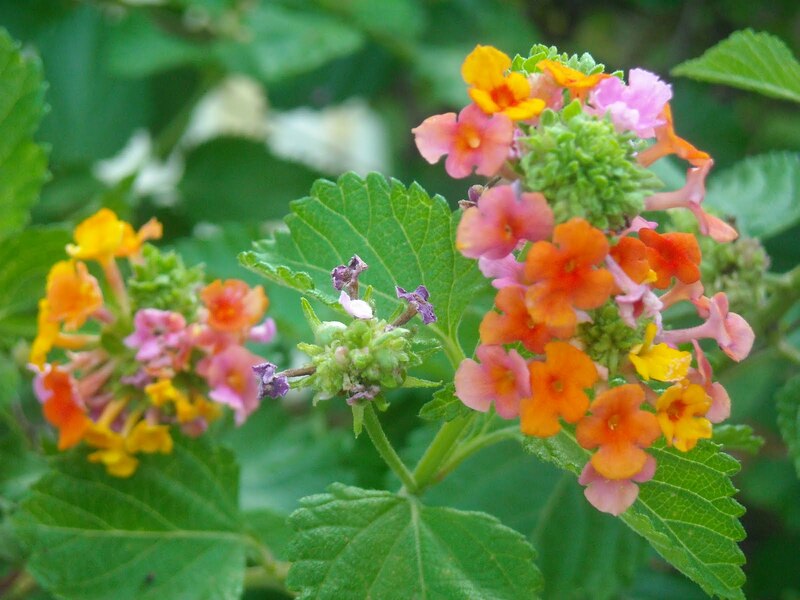 I still have some beautiful flowers in my tire gardens. 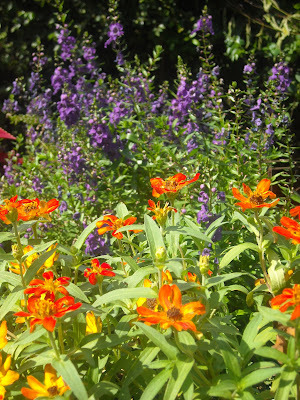 Here are some still- blooming Purple Salvia and orange Zinnias. I love looking out my kitchen window all day to such gorgeousness!!! I picked up a pack of 6 little Ichiban eggplant starts to plant in spare spots in my buckets. Once I read in my Florida Gardening book that you can keep an eggplant plant alive for 3 years, I was hooked. Someone told me that the long thin Ichibans are not as bitter as the big ones like in the store...and I have certainly found that to be true...so for 1.67 at Home Depot, I am starting me a few more. YEAH! 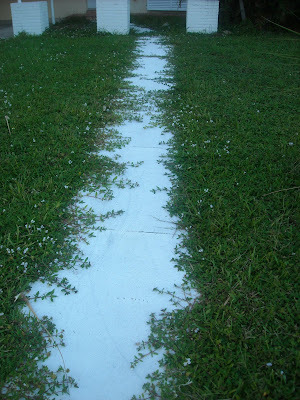 I was left with a little bit of free time today, so I went outside, watered and fertilized, and re-sprayed my okra plants with Eco Sense (insecticidal soap). 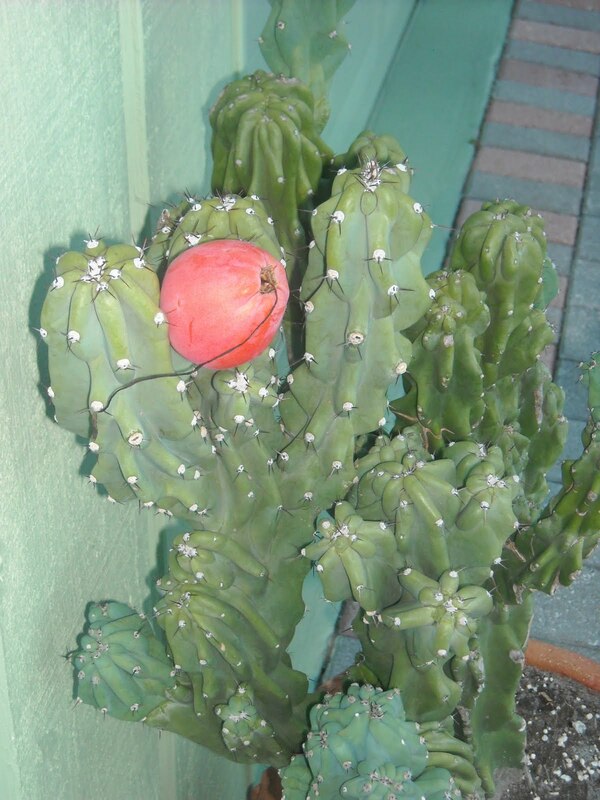 Then I took a long walk and found this really amazing fruit (love the color) on this big succulent plant that belongs to a neighbor! From the sidewalk, I thought it was a fake orange someone had stuck on it, but I soon discovered it was REAL! Isn't it just the prettiest color??? It was so cool to find. 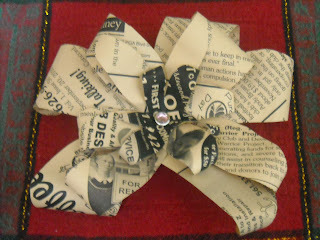 Then, I read a little bit of my library book about Susan Boyle, singer from Britains Got Talent, and I made a rather large paper bow from an old one page coffee shop newspaper I was ready to throw away. It turned out cutely, I think. Hope everyone is well. Hi everyone. 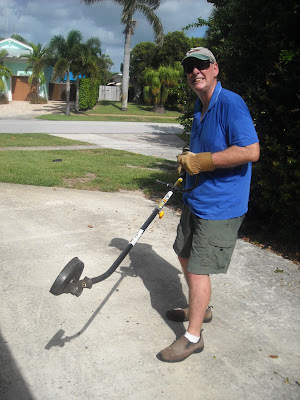 First, I would like to thank all of you for your supportive comments regarding my last job! I think it lasted all of 6 weeks! 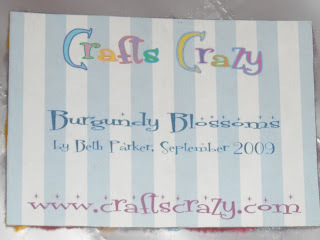 I wanted to tell you I discovered a gal named Beth over at Crafts Crazy who immediately wanted to trade ATC's. She had a few and I let her pick one of my available ones from my collection, and this is what she sent me! Here are right and left-ways views. 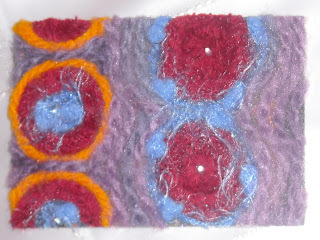 Made from yarn, with little rhinestones in the center of each circle!!! It really turned out so beautifully! I love the way she put the info on the back also! If I ever get to where I can start making them again, I will do something like this! Thanks for the trade, Beth, and NICE TO MEET YOU! If it weren't for my okra right now, I am feeling pretty low. I feel like a failure after this last job attempt. All I can say was it just wasn't for me and there was no way out except to just go. If it weren't for this lovely okra moving past all odds...flourishing under my care in buckets in a blazing summer (well, now Fall) heat...I wouldn't feel a glimmer of hope for my financial future. The job prospects are non-existant. We are living on one income (THANK GOD FOR THAT)...and people might think I am nuts for leaving that crazy assed job...but really...how much can one take for the salary? Am I just a prostitute for the money? No, I am not, and I refuse to be like that. I will sit under my okra plants and prepare inexpensive meals. Shop in the thrift stores, and entertain myself, and the family on the cheap. I suppose I am richer than I think...I've got nature, family, and friends to sustain me. I am grateful. I won Judi's giveaway, and it arrived today!!! 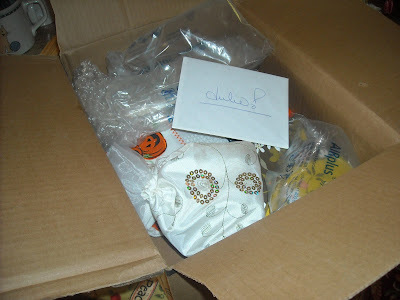 My blogger pal/buddy/friend, Judi over at Cranberry Blossoms had a giveaway, and somehow or other, I managed to win!!! Amazing and wonderful!!! I was having a sort of low day when I found out, and it really lifted me up again and gave me hope that my job situation will turn around. Thanks Judi! And what a giveaway she had!!! WOWZERS! 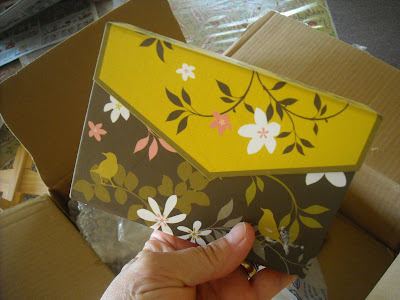 Talk about some neat things she made by hand and other goodies that just blew me away today when the box arrived! What is inside this beautiful drawstring pouch????? 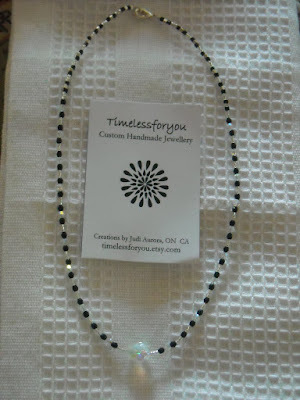 A gorgeous necklace she made herself...solid Swarovski crystals!!! 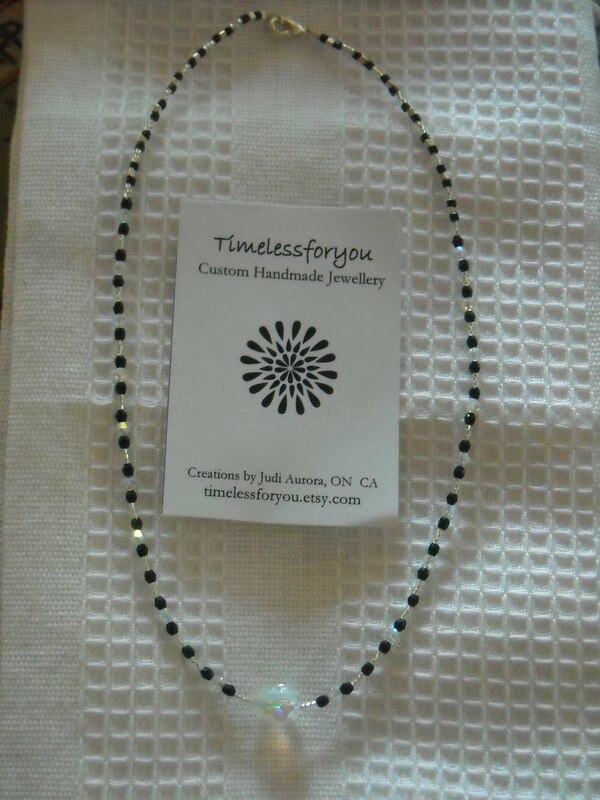 It is so lovely, Judi...all in black and white and a very beautiful large clear crystal at the bottom! 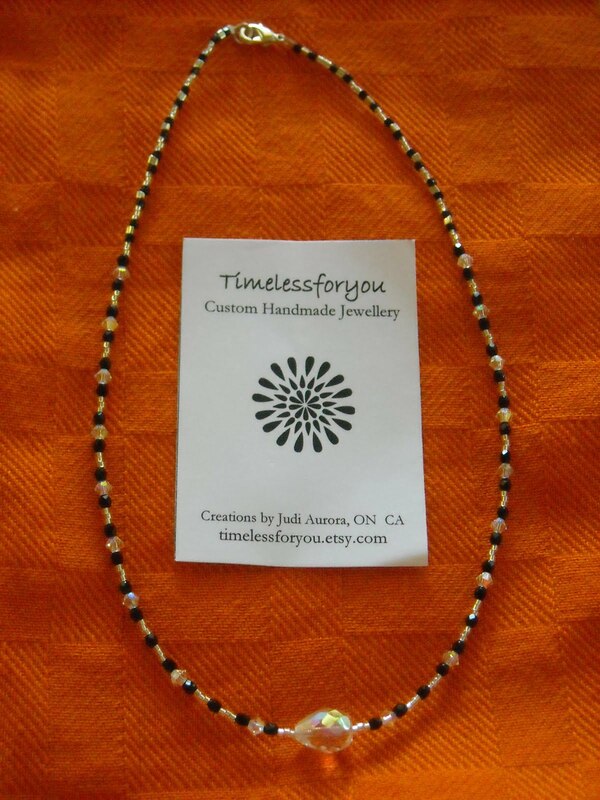 It is stunning, and can be worn with anything! Thankyou, so much Judi!!! I took a pic on two different background colors to show the beauty! Judi makes these lovelies and sells them in her Etsy shop, called Timeless For You...go by and see all of the beautiful things she makes! Next thing I found in the box was one of her gorgeous pink heart soaps! 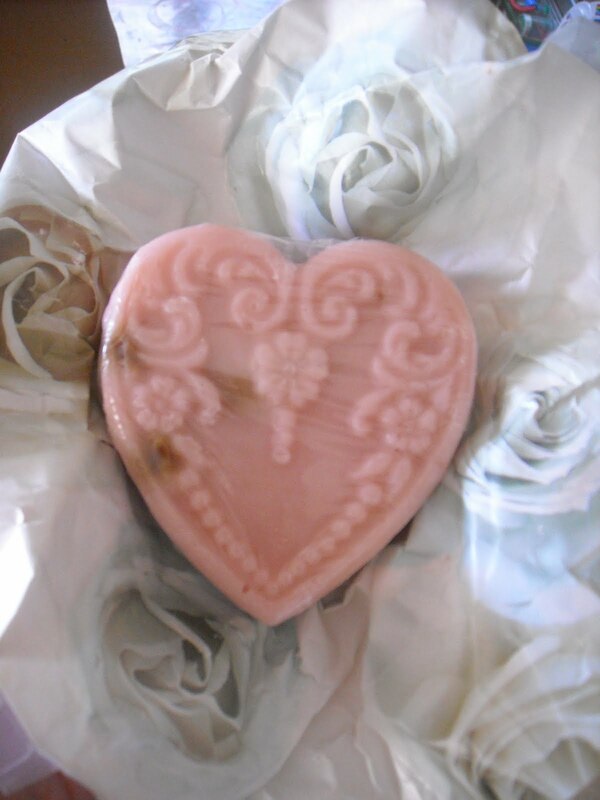 I have had her soap before and it smells wonderful and lathers like a dream! I am so pleased to have another bar!!! 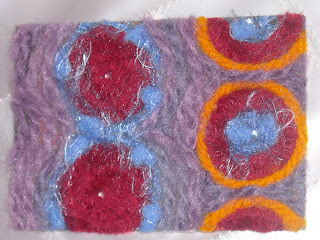 Judi sells her soap and other lushious items in her other Etsy shop called Pink Daisies. You really have to go by and check out her other items...especially the lamps made from tea pots, cups and saucers! They are all so neat, and fun! Next came a set of the cutest fall kitchen towels! Aren't they adorable...I love the top one with the ruffle at the bottom! Then I pulled out a box of note cards in perfect fall colors! Judi doesn't know it, but I am a stationery freak! 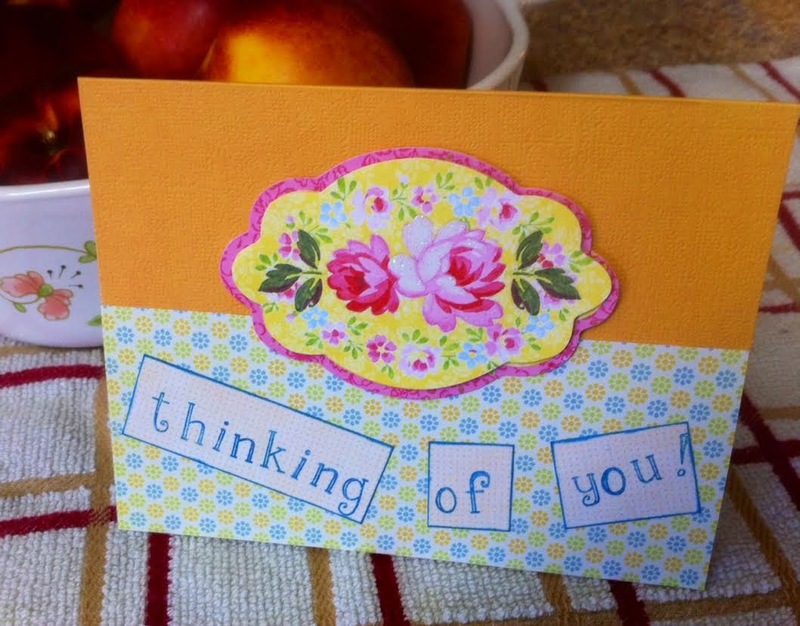 I love all manner of cards, letter stock, pens, etc. Sooooo....oh my gosh...I was so happy!!! I thought that might be the end, but there was still one more item in the box! 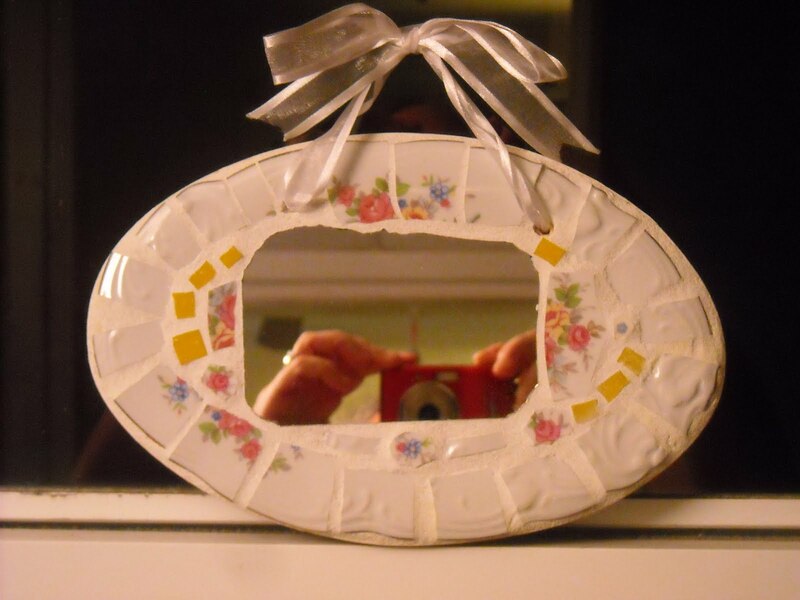 It was one of her handmade china tiled mirrors!!!!!!!!!!!!!!!!!!!!!!!!!!!! Isn't this so pretty? 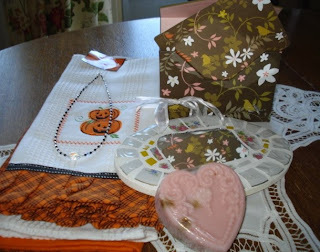 Oh Judi...how can I ever thank you enough for all of these goodies!!! My gosh! I will surprise you one of these days...just wait and see! 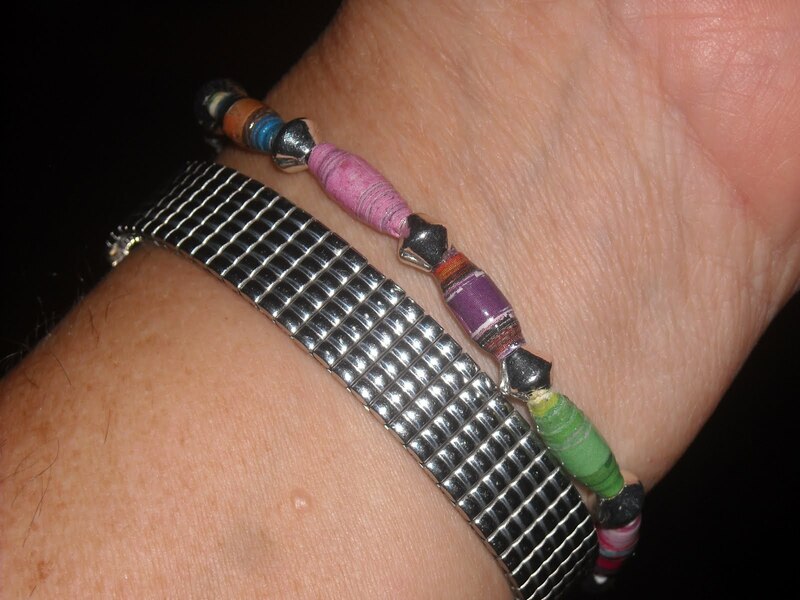 Here is the bracelet Donovan (my almost 6 year old grandson) strung for his Mommy. Isn't it adorable??? I love his color choices! 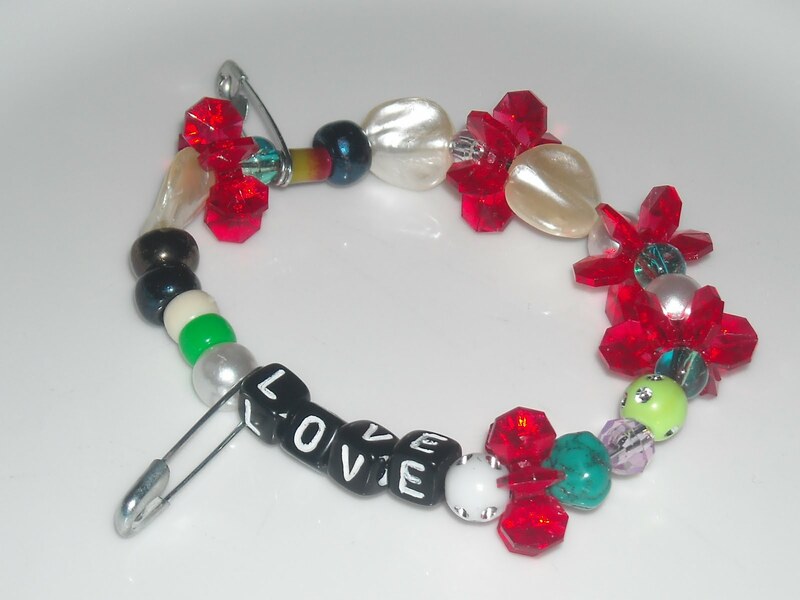 The addition of the safety pins (which just happened to be in my beading box) is priceless! The only part I ended up adding for him was the words LOVE, and only because it wasn't quiite long enough and we needed to add a few more beads! We wrapped it in the comic section of the paper and made a little card for the front! 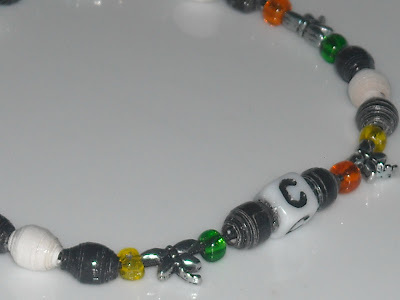 And here is a little sneak peek of a bracelet that is going out to one of my readers. It has special significants for one of you! I will post about who it was for later (after they recieve it)!!! Heeheehee. Love all of you, but this idea came to me instantly after reading a comment made by this person on my blog one day. Happy Cactus Monday...at 5 minutes before midnight! This is the spineless prickly pear that I started a while ago from the big tree that was cut down in my neighborhood! It is growing, and has been a lot of fun to watch, with anticipation!!! 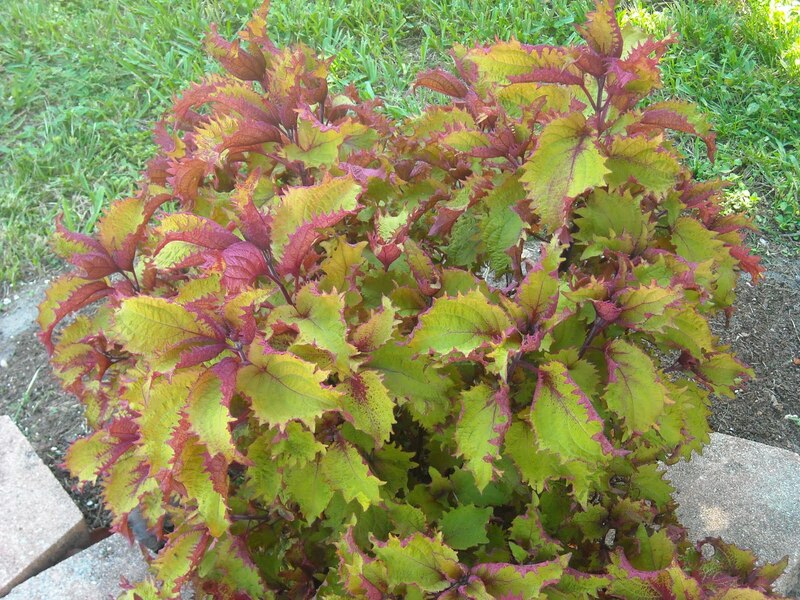 Below is my neighbor's beautiful curly-leaved Coleus! It has grown tremendously since she has planted it...and I am becoming more enamored with Coleus everyday! What a beauty! 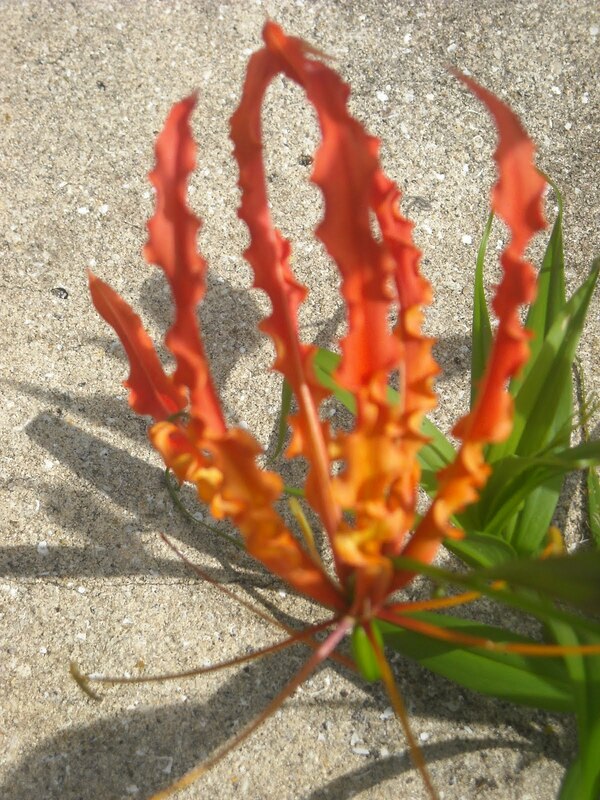 Now here is another thing she has planted in her front garden. 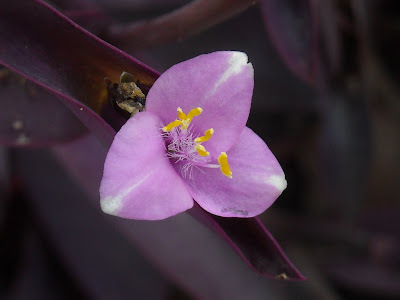 I like purple Wandering Jew, but when it flowers, I LOVE it! 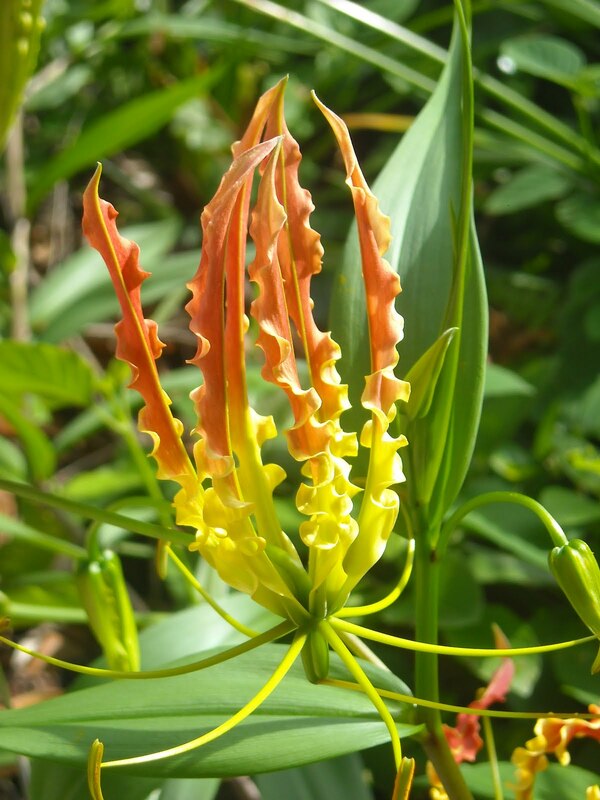 Is this not the sweetest flower EVER??? Been goofing around with making bracelets! 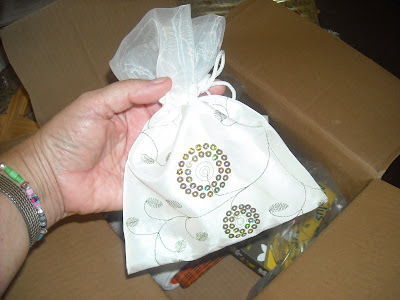 Swarovsky, glass, and crystal beads...my Mom is a beading enthusiast, and she is so hoping I will become one also. I keep telling her that that will happen the day I decide that I LOVE Costco! (I can't take shopping there...too large a quantities for me), and the store drives me crazy because of size (same at Sam's Club). I must be a real weirdo. OK, here is my second okra bloom (to my knowledge), and a few other flowering pretties today! 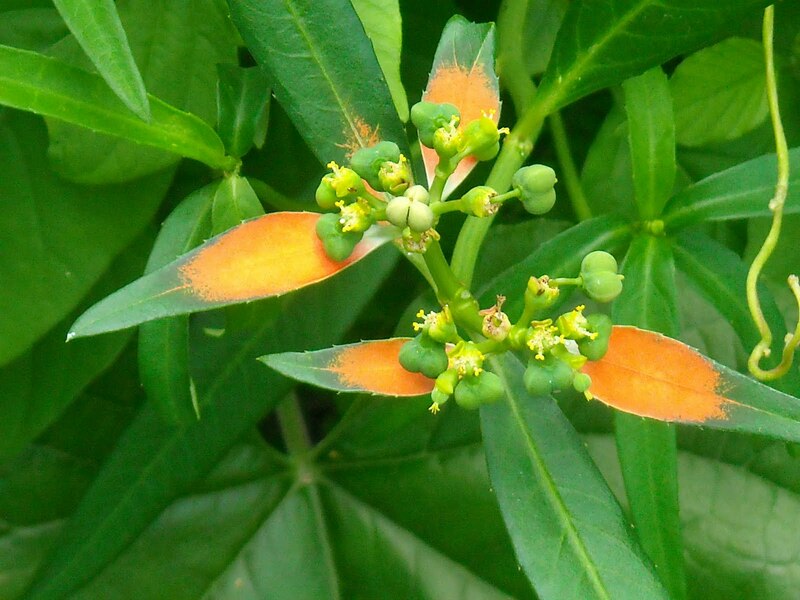 Orange plants and okra update! 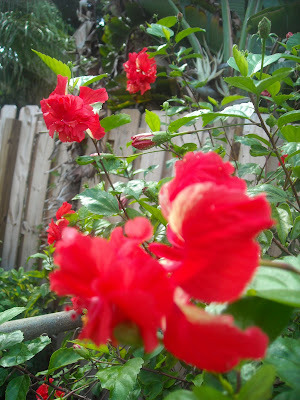 These wild poinsettas have suddenly sprung forth in my backyard! They are coming out everywhere and I just adore them! 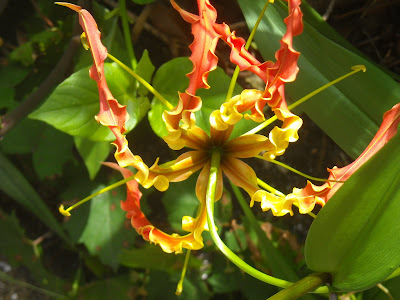 Between the orange gloriosas and these, it looks like my yard knows it is turning to FALL. I can't hardly take all these oranges! Just gorgeous!!! I am grateful for so many things, and I am really grateful for my orange plants too!!! 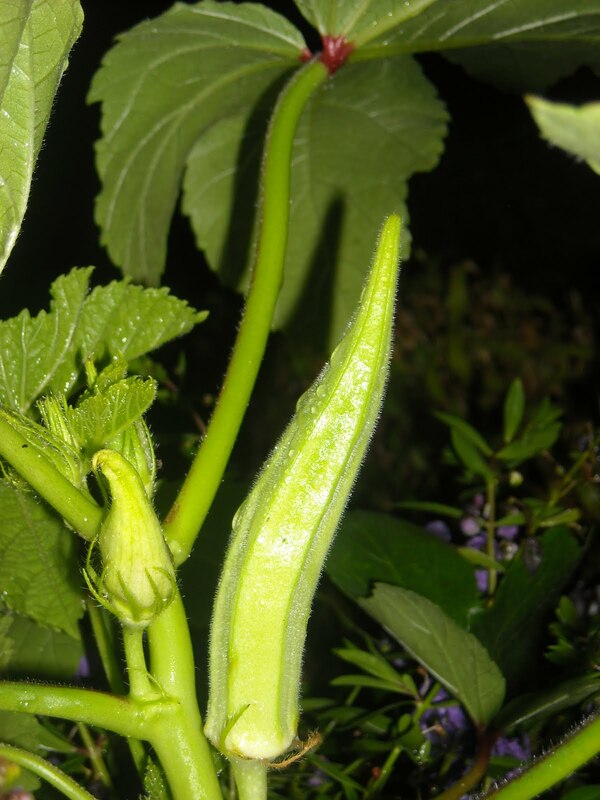 Update on okra: First I went outside last night after dark and found absolutely NOTHING on the plants. I used a flashlight and inspected top and bottom of leaves, and along stems/stalks and dirt too (looking for snails, possibly)...and found ZILCH. This is a good thing, I suppose...but yet the mystery remains as to what my leaves are being munched away by!!!! 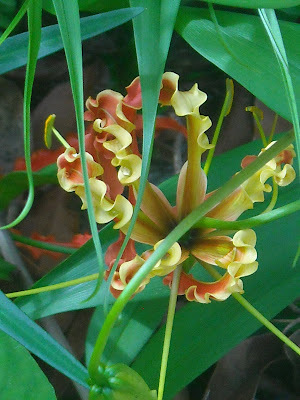 The pic above shows what I found today when I went out to take a photo of the first flower, and here is what I found! The flower had already fallen off and the okra was peeking out! You can see it here in the same location where I had previously shown the bud. So...now we will see how long it takes to grow an okra pod!!! OMG! 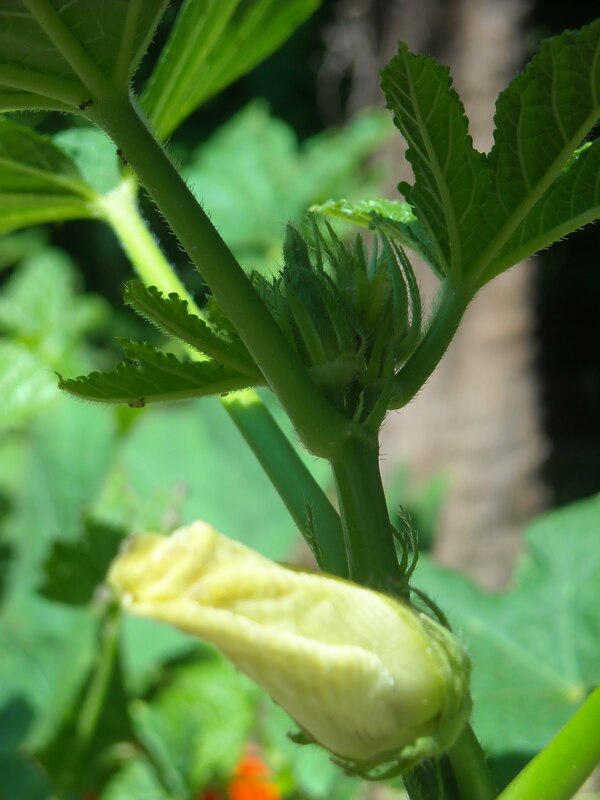 My first okra bud!!! 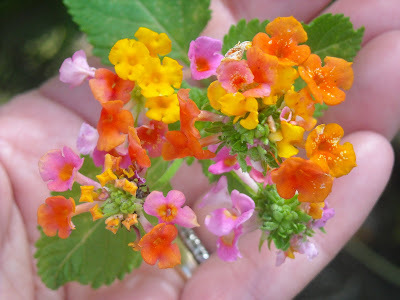 I was walking out to re-spray for aphids (soapy solution), and something large, and cream colored caught my eye. I got exciting thinking it could be a bud. Sure enough, it is about 2.5 inches long. I'm sure it will be open by tomorrow. More pics to follow! 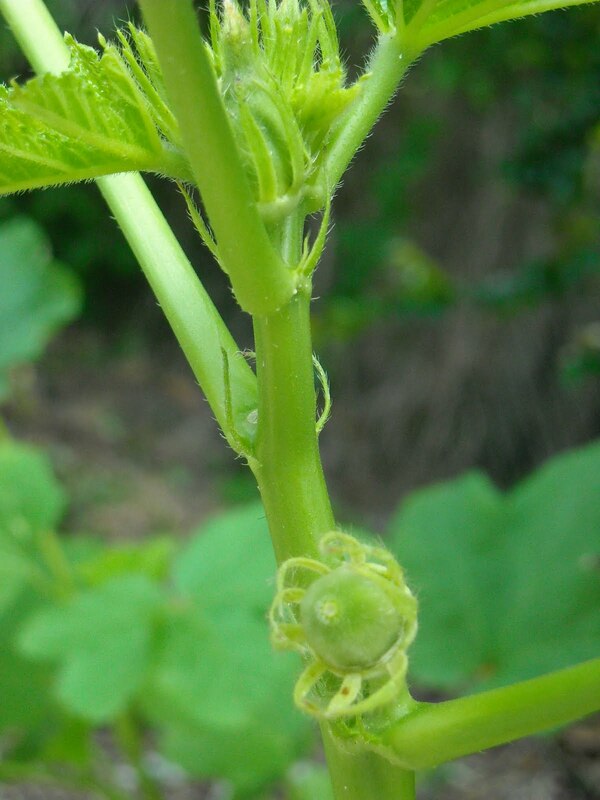 Then I can watch my first little baby okra develop! I don't know the variety of okra yet...if large or small. I think it will be safe to pick by 3-4 inches long though, so as not to let it get too woody, but I will let some get larger just to see how big they WILL get. How fun! I am super excited. Wish me luck! 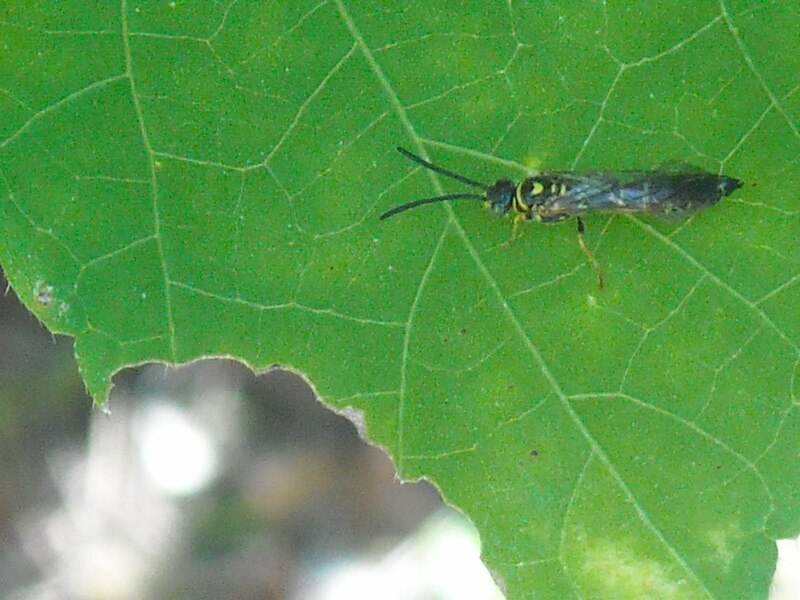 I am going out tonight at 2:30am EST (after work), with a flashlight, to look for what is eating my leaves. If it is a caterpillar I will drop them into a bug house I have and put a few leaves in there for them and maybe we can watch them change to butterflies/moths/whatever. I wonder what other kids of leaves they would like to eat...I will have to find out when I see the caterpillars. 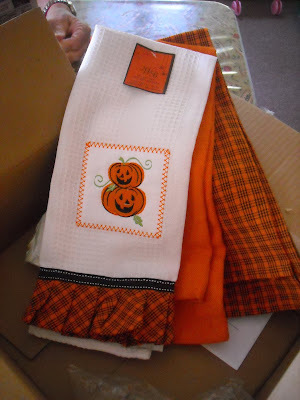 My blogging buddy, Judi, from Cranberry Blossom is having a giveaway tonight! She is giving away some of her beautiful, luscious soap, a pretty mirror she tiled with china, and a gorgeous necklace she made, plus it looks like two more mystery gifts have been added!!! Sorry I did not get this posted sooner...she would like everyone to come over and take a chance at winning...so if you have a minute, this link will take you right to it. Good luck! Doozey says hi! She looks kinda sleepy...hey, I am too! She stays up half the night with me, so I guess the poor girl is suffering as well. 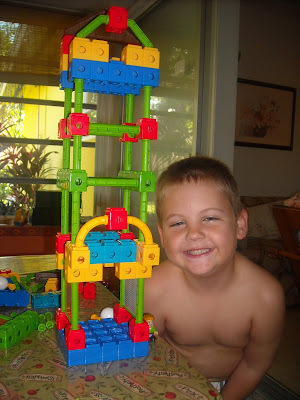 Dono is so happy with these new Trio building blocks...found them on sale at Walmart, so bought several packs. We have built some really cool stuff. I see they have the whole Batman series in Trio ...I am thinking about his birthday coming up! 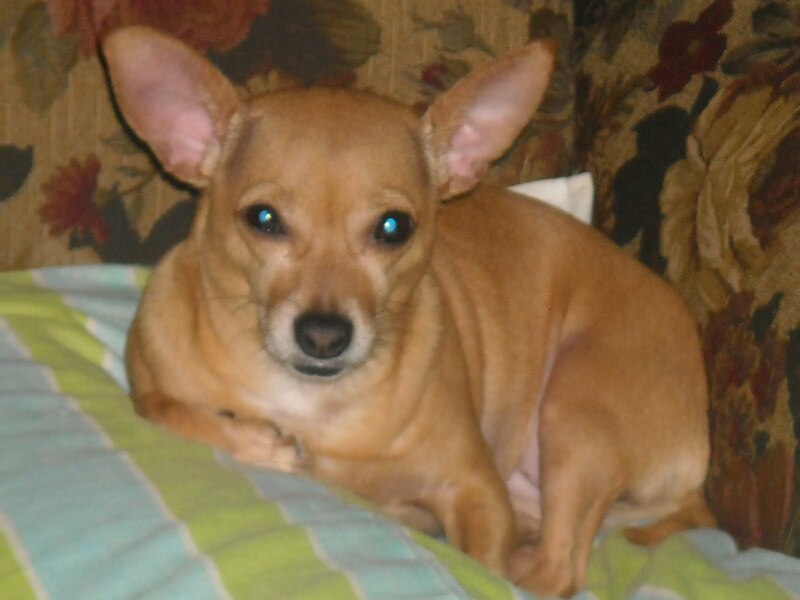 He will be 6 on Dec. 28! Isn't he the cutest builder, EVER??? 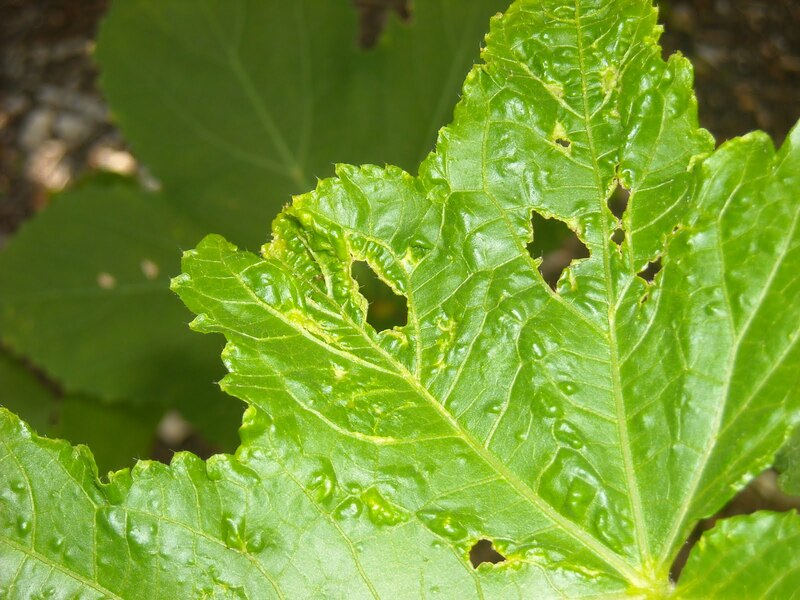 Latest development with the okra plants...something is munching holes in the leaves...only a few so far. Here was a bug I found flying and landing on the leaves today. I don't think these guys are munchers...just flying about. I think the aphids are starting back again too...time to re-spray with Ecosense by Ortho. I am busy every minute of every single day. I suppose it is a good thing...maybe it is keeping me young...or...most likely it is making me old. That's how I feel today, anyway. Tomorrow is back to work day. I'm not ready. Gotta get some sleep.....wish me luck. I am having a cup of Sleepytime Tea right now! 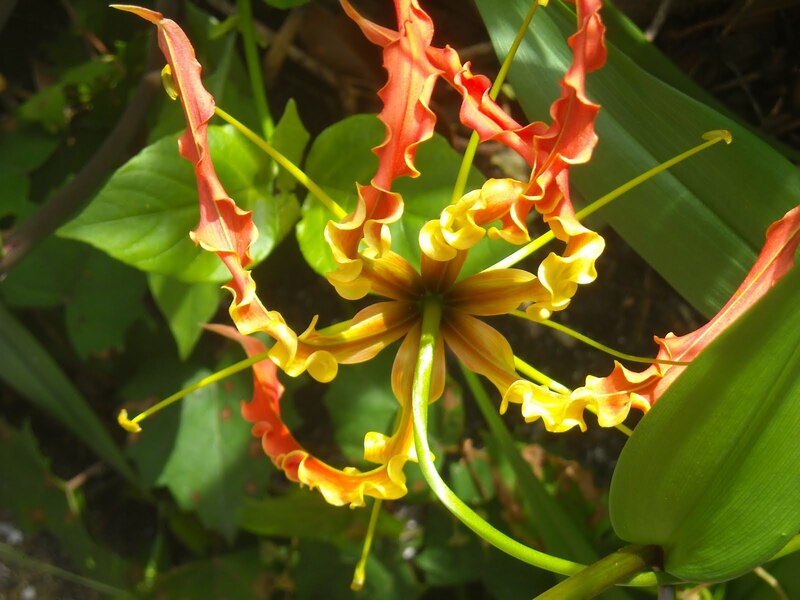 Mom and I realized (now that mine are blooming), that my Gloriosa lilies are much frillier than hers! 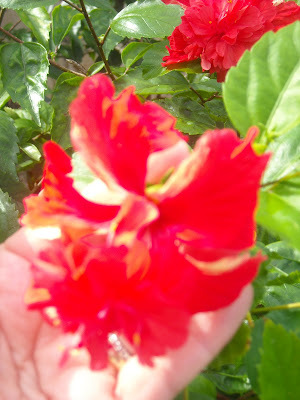 Hers have broader, flatter petals...not all the curls. These are my girliest girl plants!!! Hehehe. Good day everyone! Happy Monday! 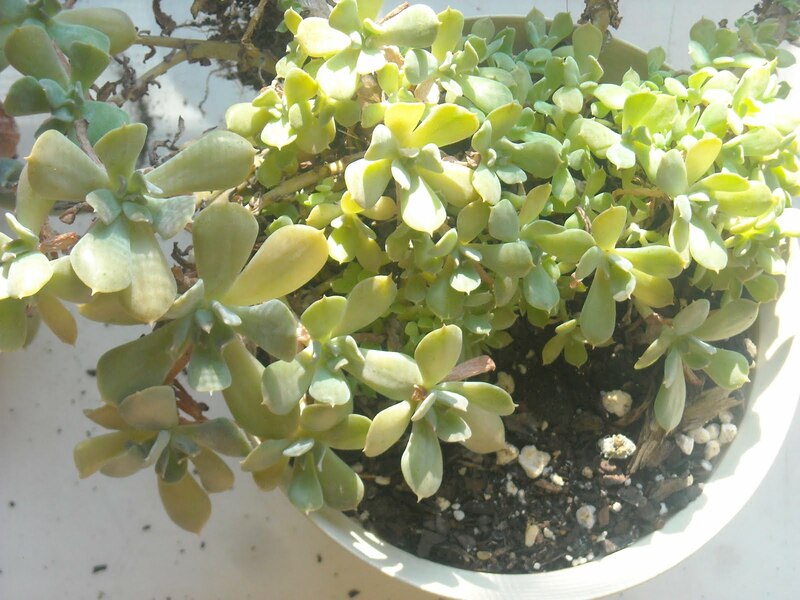 I have no idea what the name of this succulent is...I have had it for years, and it grows slowly for me, but has gotten a lot larger and is so pretty. Happy in shade, hanging out with the other sux in the screenroom. I am so looking forward to cooler air, when I can get out there and work with my plants. 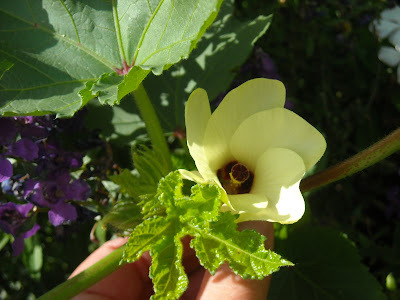 I do walk out daily to check on the progress of the okra blooms....they are all still buds...but since I re-fertilized, the leaves are a lovely dark green. The buds are growing larger, and I keep thinking "any day now"!!! I am thinking I may be visiting IKEA today...that will be fun! My new job's hours are keeping me sort of like a zombie all week! Working until 2am, and not getting home till 2:30am...then having a snack and...BAM...I still cannot fall asleep till nearly 4am on those three days (Thurs-Fr-Sat) each week.....and now it is Monday and I am all screwed up with my sleeping!!! The California and Colorado fires are so disturbing!!! Just terrible. You know how much I love my California...it hurts me to see places burn up. That gas line explosion was just aweful. The latest art around here is litle Emily with a new little chalkboard...she loves it! 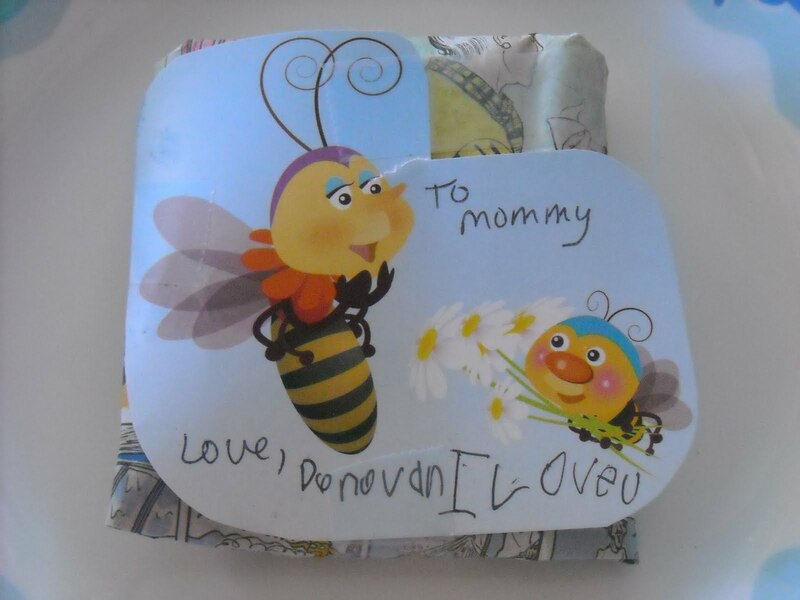 Drawing, scribbling, carrying it with her all around the house! What a darling little girl! I'm not MADLY in love! Oh no...not at all...yeah right!!! Not much else happening...oh there is one little thing...a new tiny little art studio opened up right next to the art store here...I peeked in the window yesterday (closed on Sundays), and three artists works were on display! I must go over soon to check it out! One thing the owner/artist is doing is "Stamp Art" where she actually paints a real stamp on a large canvas...the ones that have a "cancelled stamp" on them are really pretty! Add note: I just woke up and it is 11:15pm on Monday night, only to discover that I had started this post yesterday and I fell asleep and never hit the PUBLISH button. I am messed up with my sleep now. Exhausted. Oh dear... Well...at least it is still 45 more minutes until the clock rolls over to Tuesday and I can still say Happy Cactus Monday everyone!!! 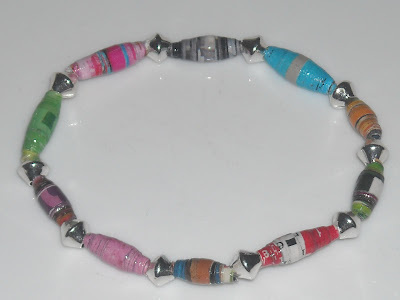 Continuing on with bead projects! Now that my aphids are all dead and gone, I can concentrate on beads once again! Tonight my hubby got home from work and handed me a little package. 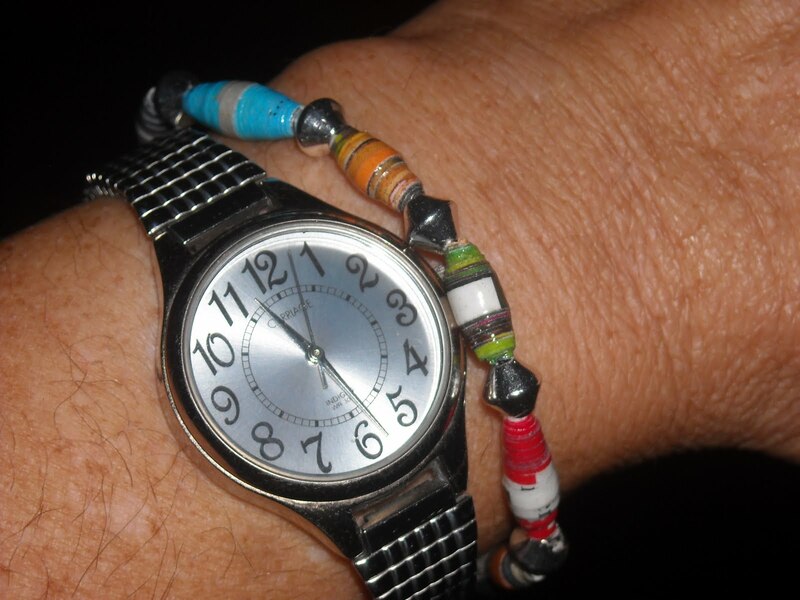 It was from the gal in his office I had sent a variety of 10 beads to, so she could make jewelry. Well, lo and behold, she sent them back to me as a bracelet, so I could show what I had made! She put them on a stretchy band and put little silver spacers in between each bead! I LOVE IT!!! I really like that it has a lot of different colors in it, and I feel I may just wear it till it wears out. I will put it right here on the blog so I will know if the beads show any deterioration or just fall apart (I hope never)!!! Anyway, she also asked me to make her beads!!! I tell you, I am enjoying it so much, I may do it just for the cost of the varnish! Here are 20 little bitty ones I made for her tonight! I am putting 3 coats of glossy clear fingernail polish on them and that seems to be just enough shine. 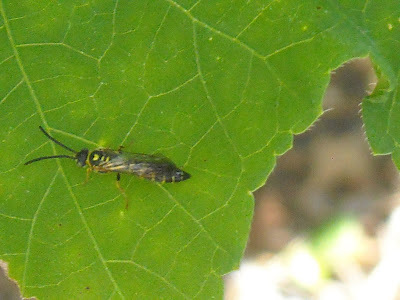 These measure about 3/8th of an inch in length. You can't really tell it here, but these were made from one single page from a magazine that has a dark cranberry, brown and black as it's primary colors and they look very rich, and also sort of gothic to me. Modern and sleek. 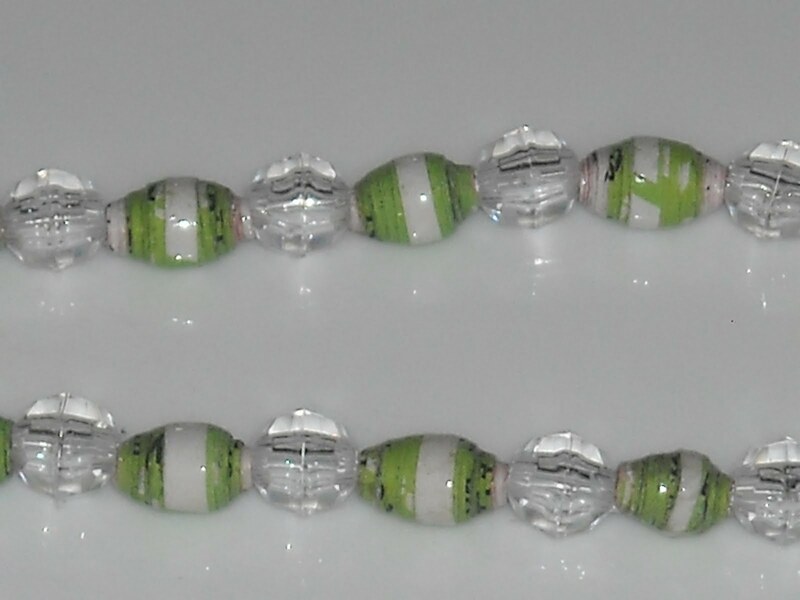 Now here are the ones I made for my sister who has been wearing a lot of lime green she says! 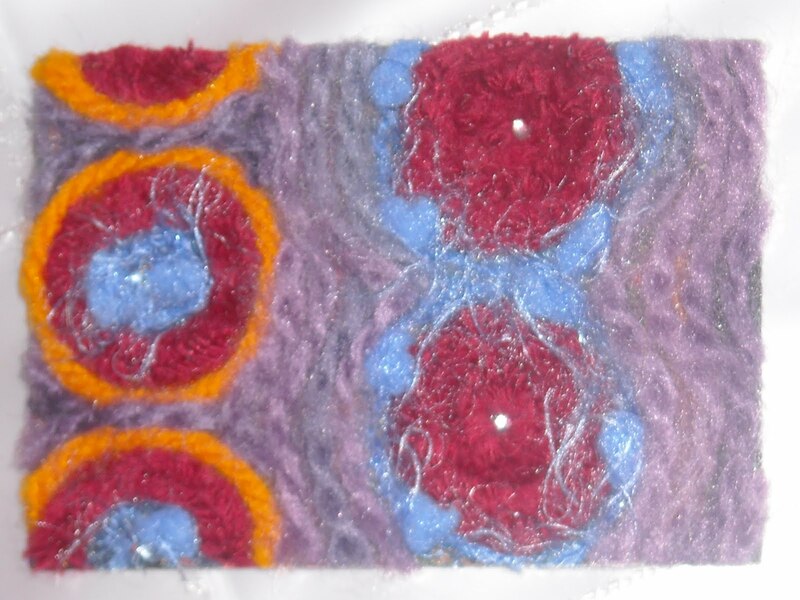 I added the little clear cut beads in between, and am looking for what will be perfect spacers for her beads, still. These are just there for the pictures. Anyway, my Mom has agreed to do the making into a bracelet part for me (thank God)...and we are doing them on wire with a silver lobster claw clasp with a safety. I am thinking we will use Swarovsky crystals and silver for spacers to give it a real upgraded look, since she will be wearing it for her very professional job! I have never been one to enjoy making jewelry, but this process of just making the beads, is wonderful!!! Who would have known??? Hehehe. 1. 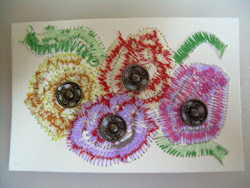 Look for a page that has similar color theme throughout, and use it to cut all of the beads you can for a unified look. I did this for the lime green and the cranberry, brown and black minis above. 2. If your page has multiple colors on it, remember to cut so that the narrowest end has the color you want to see on it, as this will be your most outer layer. 3. Keep experimenting with everything, so you can find out what works best. Every time I look at a new page, I think of something to try. 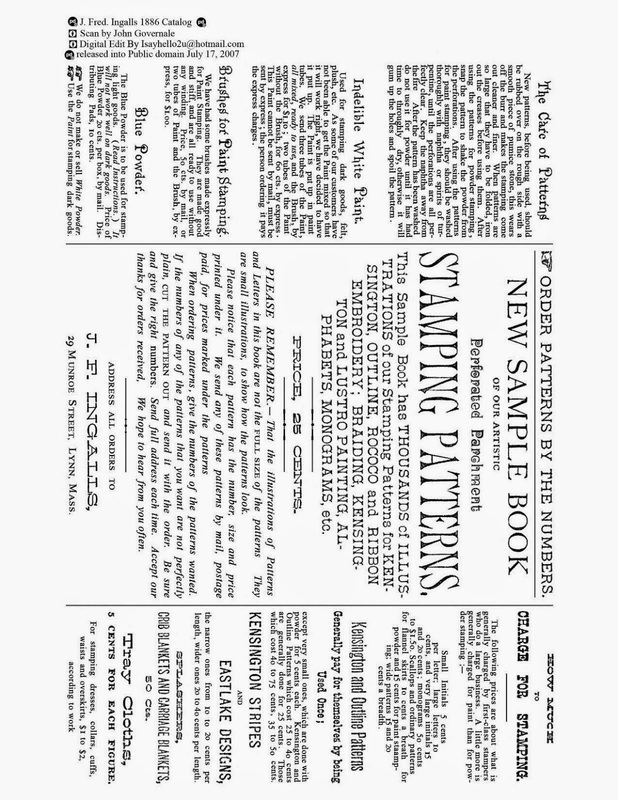 For example, one free advertisement that came in the mail, I noticed, has a solid black border on the edge of each page. 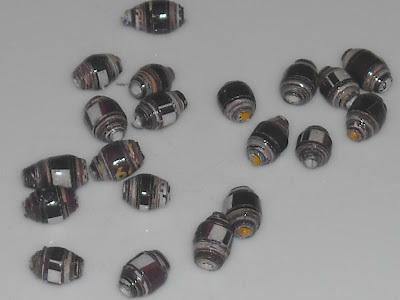 Now, that has become my next 20 beads...they will be all black and I will make them very tiny as accent beads, and they are gonna be so great...I can already tell that I will really love them! Hope you enjoyed seeing all my beads so far!!! 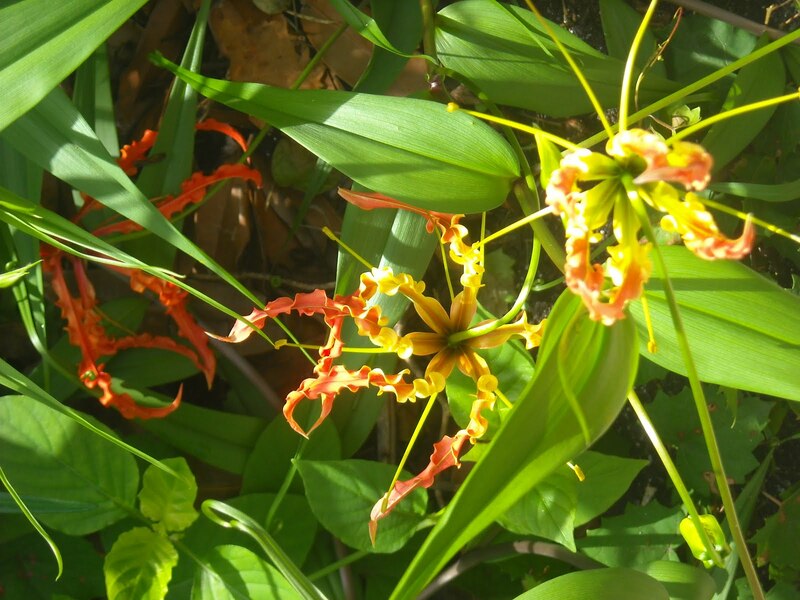 Bead making adventures, and a Fall welcoming pot! The bad, the wonderful, and the beautiful!